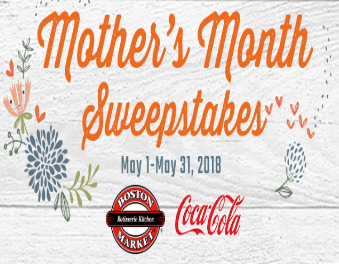 Boston Market Mother’s Month Sweepstakes – Win a Family Vacation to Great Wolf Lodge! Win a Family vacation to Great Wolf Lodge or other great prizes! ENTER SWEEPSTAKES HERE – Boston Market Sweepstakes page. ENTRY LIMIT – Limit one (1) Sweepstakes entry per person/email per Daily Entry Period. legal residents of the 48 contiguous United States (and the District of Columbia) who are 18 (19 for residents of Alabama and Nebraska) years of age or older at the time of entry. SWEEPSTAKES ENTRY PERIOD – : The Sweepstakes begins at 12:00:00 a.m. Eastern Time (“ET”) on May 1, 2018 and ends at 11:59:59 p.m. ET on May 31, 2018. The Family Vacation Prize includes: one (1) 3-night stay Great Wolf Lodge hotel voucher for winner and up to three (3) guests (subject to certain terms and restrictions), four (4) roundtrip coach-class fair-restricted Delta Airline vouchers and one (1) $500 Visa gift card. ARV: $4,600.